So, I have been preparing a fairly large garden, 4m X 12m, but it will need expanding, as I now realize there isn't enough room for all the potatoes... ooops. I have been propagating plants which are nearly ready to plant out. Cabbages, broccoli, kale, beetroot, silverbeet (chard) are all about to go in the ground. Also, the garlic (all 80 cloves or so... ) that arrived recently from the Digger's Club. I have been preparing the beds with gypsum, wood ash from the pizza oven, and as much horse, alpaca and chook poo as I can. The soil is ok, but its not as good as the garden beds that we are leaving behind... The soil will take time to become enriched, its a long term committment, to establish a garden and help build the soil. 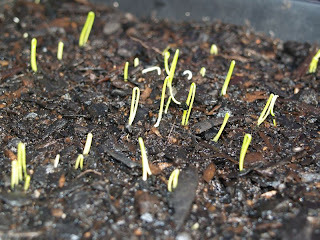 After the winter solistice (June 21st) I will plant out the onions. I have planted over 200 seeds, but will do another seed pack soon. I have always loved growing onions, despite them being cheap to buy, they are easy to grow, and organic onions are hard to find around here... Here are my little babies, just popping their head up. Something that I have decided to do as of now, is keep a garden diary. I think it will help to refine my skills and improve our crops over the years. This is my main focus now - apart from my household duties, and taking care of the kids - to grow a large proportion of our food. Your onions look good too! Good idea, your diary. I write in things on the big planner calendars...it is a good way to keep track.